If you have stumbled upon our website and found yourself reading about why you should consider Rental Crates.com, chances are, you are an innovative and savvy person who believes in seeking out and finding ways to pack and move smarter, not harder. After all, boxes for moving should be easy to use and convenient. We launched our business with the hopes of pioneers like yourself trying our plastic moving boxes and loving them so much that you actually help kickstart a revolution to change the way people in the United States pack and move. We never expected our journey to be easy. There were competitors who were doubters, initial startup costs that were high, and cardboard box industry experts and suppliers who said we were crazy. However, we pressed on because we believed providing a better, easier, cheaper, and more environmentally friendly alternative to cardboard boxes was important enough for us to do it, even if the odds were not in our favor. 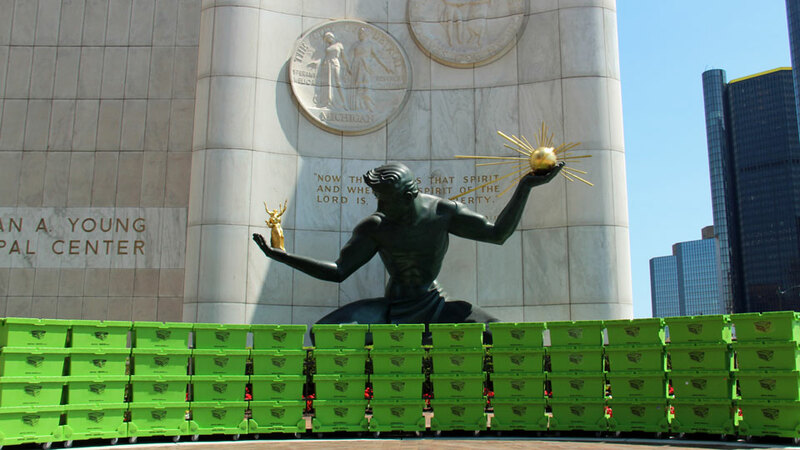 Six years later, we have grown to become the dominant supplier of thousands of green moving boxes to people moving their homes or businesses in the Detroit Market. But none of the momentum or success we have experienced, would have even been possible had we simply just set out to offer reusable moving boxes just to be different. We have succeeded and continue to really change the landscape of the entire moving process because we set out to be better, better than what everyone had settled for as the way it had to be. With the help of people like yourself, we will continue to challenge the status quo because making your life easier when it comes to packing and moving is our passion. It has been said that insanity is defined as doing the same thing over and over again and expecting a different result. Well, since 1890, people have been packing and moving the same way… using cardboard boxes. It is what we have been taught. Our fathers did it, our father’s fathers’ did it. Sadly, we have all endured the overly difficult challenges that cardboard boxes present when preparing for a move. It is time to stop the insanity and question everything you were ever taught about boxes for moving. Perhaps like most people preparing for a move, you have driven to one of the the big box stores to buy cardboard boxes only to be staring down an intimidating long aisle of cardboard, unsure of how many boxes to purchase or which types of boxes you really need. Inevitably, you will probably buy too many, or maybe not enough. Either way, you have to hope all those cardboard boxes you buy will fit in your car. If not, better plan on making a couple trips to the store. Wouldn’t it be great to avoid all this hassle and be able to order your moving boxes online and have packing materials delivered right to your doorstep? At Rental Crates.com, we bring convenience to the packing process. Just visit us online and select from our pre-bundled packages of boxes. No more struggling to determine how many boxes you need or trying to stuff them all into your car. Instead, place your order and within 24 to 48 hours we will deliver everything right to your home, office, apartment, loft, or condo. So you purchased cardboard boxes, now what? From the minute you arrive home with your cardboard boxes you will have to make multiple trips schlepping them into your home just to start packing. Wait a second, did we say… “start packing”? Before you even think about packing, you have to assemble all those cardboard boxes. You will probably spend the first few minutes just trying to use your fingernails to feel along the roll of tape to find where the heck the actual start of the roll of tape begins. Now you are finally ready to start folding and taping everything together. After some more time and some perspiration, you should have some of your cardboard boxes together, but now you have to fill them with all of your items, tape them closed, and bend your wrist into an uncomfortable position to try to write the list of contents you packed into each box. At Rental Crates.com, we value your time, and we believe there are many more important things that you should be doing instead of taping and building cardboard boxes. That is why we guarantee to cut your packing time in half by renting plastic moving bins that arrive pre-assembled and require no tape. Simply fill our Rental Crates with your contents, close the attached lids, and get back to doing the things you enjoy. Life is too short to waste it packing, so use the the best moving supplies that will reduce your pack time. Anyone who has packed cardboard boxes, immediately sees the weak structural integrity of cardboard as you begin to move a heavy box you filled with books. You know the feeling of a box when the bottom wants to come out from your hands as you lift it. Then just wait until you try and start to to stack them up. Inevitably, the stack will begin to crush and shift in one direction. Your heavy stacked boxes will begin to resemble the Leaning Tower of Pisa. Worse yet, the crushed cardboard could be causing havoc on the glassware and dishes or any other fragile item you may have packed. Now imagine moving day and you need to optimize space inside your moving truck so you can fit everything. Stacking your boxes does not seem like the greatest idea when they begin to crush after you place the 4th box on the pile. Plus, moving trucks ride rough so it will be bouncing over potholes and jarring your box pile even worse. At Rental Crates.com, our reusable plastic boxes come with “True form” ergonomic carrying handles designed for sturdy comfortable lifting able to withstand heavier weight than cardboard. This means you can fill one whole Medium Rental Crate with your heavy books and not worry about the bottom falling apart. Rental Crates are made from 10 lbs of high density polypropylene. They are crush proof and water resistant. No more crushed cardboard boxes causing whatever you packed to be smashed to pieces during the move. Plus, our Rental Crates come in standard sizes and are structurally designed to be stacked as high as the moving truck ceiling. This means better utilization of space inside inside your moving truck, eliminating the need for additional moving trucks or additional trips. No more crushed cardboard, just a strong stack of plastic moving boxes ready for packing and moving. Cardboard boxes offer little in terms keeping the contents private or secure during a move. Things like your human resource files, medical records, social security information, or financial records are all easily accessible to wandering eyes by simply peeling back some tape opening up your box. Maybe you are moving the cardboard boxes yourself so you don’t have to worry about it, but if you are hiring a moving company to move you, perhaps you should think about the actual security of your boxes. Our Rental Crates meet HIPAA guidelines to legally secure your most valuable documents or items. As a added security measure, we can provide you with Zip Ties to lock down the lids and prevent easy access to the packed items. 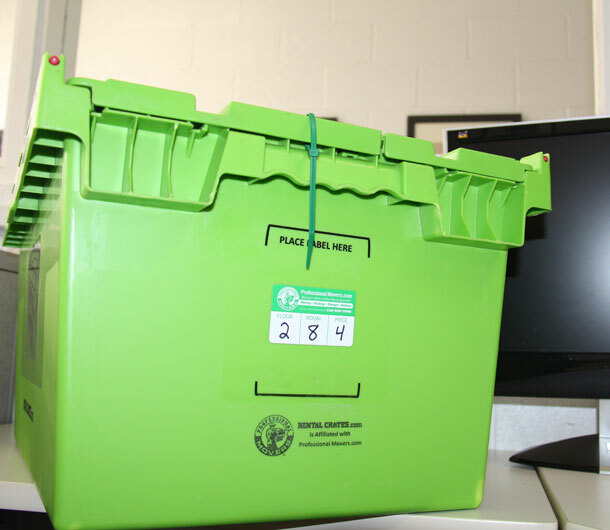 When zip ties are fastened to our green boxes, it is impossible to open the containers without breaking or tampering with the seals. That is why our Rental Crates have been a top choice for anyone moving items or files that need to be kept private. Cardboard boxes are expensive. Don’t take our word for it, compare any of our pre-bundled Rental Crates package prices to what it would cost to purchase the equivalent packing materials in cardboard. Remember, our moving totes are bigger than traditional cardboard boxes so you will have to purchase more cardboard boxes just to match the same cubic packing space. Don’t forget, you will also need to purchase tape to be able to assemble all those cardboard boxes. Now on top of that, think about what your time is worth. You will have to go to the store to buy your boxes and spend time assembling all those cardboard boxes. When it comes to moving, the cardboard boxes will also drive up your moving costs since they are not easily movable once packed. Our plastic moving boxes are engineered to fit neatly in our custom Rental Skates or used with our Rental Dolly. This makes moving our Rental Crates extremely easy since they are mobile. If you plan on hiring a moving company to relocate you, the Rental Crates will translate into less moving time which means less moving costs. Most local moves are based on hourly rates so less time spent moving means less overall moving costs. As for loading your moving truck, the cardboard boxes can not be stacked as high inside a moving truck. This means the possibility of not fitting everything on your moving truck and needing to make multiple trips. Again, if you are paying for movers this will mean more time and more money. Our Rental Crates can be stacked as high as the interior of your moving truck will allow. So loading will be easier and faster. You will fit more of your stuff into the moving truck and mitigate the need to make multiple trips or waste additional time. Everyday, precious trees are cut down to make cardboard boxes that often used only once, or maybe twice before they are crushed and torn from use and discarded. When you think about the statistics, 16% of our population move every year, creating an incredible amount of cardboard waste. We have all driven through our neighborhoods and seen the trash cans stuffed with cardboard after a new neighbor moves in. Stacks and stacks of cardboard along the curb waiting to be picked up by the garbage man and sent off to the landfill. Cardboard has conditioned us to believing this disposability culture and lifestyle is ok. We all draw our lines somewhere, deciding what is acceptable and what is wasteful. The fact is, nobody can disagree that cardboard is wasteful, but up until now it was not preventable. At Rental Crates.com we offer you a cost effective and conscious choice to move towards sustainability. Rental Crates are made from 100% recyclable plastic. Our plastic boxes are environmentally friendly and reused multiple times over and over again. In fact, our eco friendly moving boxes are used on hundreds of moves before they are recycled. That means, we can confidently say packing with Rental Crates offer you the lowest environmental impact, and greatly lessen the contribution of cardboard to landfills. So you can pack and move guilt-free, knowing you are doing your part to stop the vicious cycle of waste. In your search to make life easier on yourself, your family, your friends, employees, and evening your moving company, you have come to the right place. At Rental Crates.com we make packing your home or office simple, cost-effective, and environmentally friendly. For less than what it costs to to purchase cardboard boxes, we rent and deliver fully assembled plastic moving boxes right to your doorstep. Our plastic moving boxes or Rental Crates as we call them, require no tape, are bigger and stronger than a traditional cardboard moving box. They stack neatly on one of our Rental Skates or Rental Dollies so you can easily roll your packed boxes anywhere you want. When you are done with our Rental Crates, we pick them up, clean them, and then rent them to the next customer. 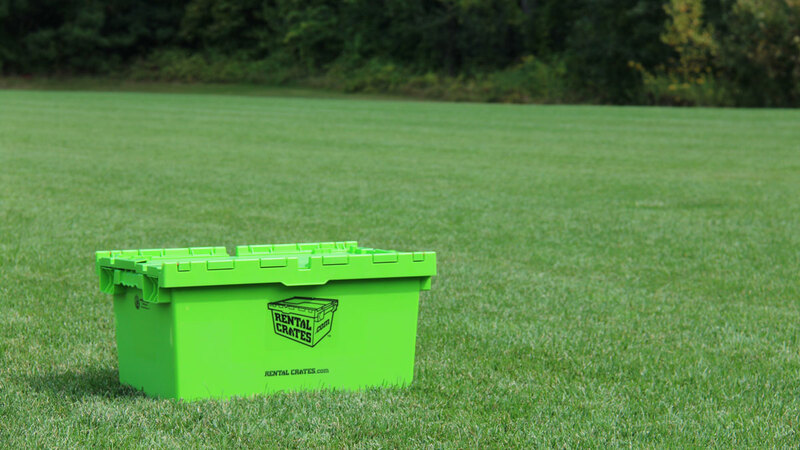 Since our Rental Crates are made from 100% recyclable plastic and are so durable, they can be reused up to 400 times. In fact, using rental crates generates 95% less total solid waste, requires 39% less energy, and generates 29% less total greenhouse gas emissions than cardboard. This means that by using Rental Crates, you are making a positive environmental impact on the world.